The 7th edition of Ayam Beirut Al Cinema’iya (Cinema Days of Beirut), a film festival happening every two years, is taking place in 2013 from March 15th to 24th. Beirut DC, organizers of the event, offered The JR Express a press festival pass and thus the opportunity to know more about the 49 films being screened. The festival screens feature films, documentaries and shorts by independent Arab productions and organizes panels, networking sessions and master classes in the cinematography field. Cinema Days of Beirut seems really interesting and it is a great opportunity to watch independent Arab movies and support the filmmakers. That’s why, I prepared for you, dear readers, a selection of the 10 most interesting movies providing you with their synopsis, poster and screening date and time. You will also find the full schedule of the festival screenings at the bottom of the post. Ayam Beirut Al Cinema’iya is taking place at Cinema Metropolis (Sofil) and the ticket price is 5,ooo LBP for a screening, 60,000 LBP for a festival pass and 45,000 LBP for a student pass. Everyday Wadjda passes a toy store window with a beautiful green bicycle. Although it is forbidden for girls to ride bicycles in Saudi Arabia, Wadjda concocts a plan to earn enough money to afford the bike. But her plans are soon exposed, leaving her with only one last chance to make the money she needs. This is the first movie directed by a Saudi women. Friday, March 15th at 7:30PM. In the early 1960’s, a group of students from the Haigazian University led by their professor, Manoug Manougian, designed and launched rockets for space exploration. Although the program was successful, it came to a sudden end in 1967 and was erased from the collective memory. Through testimonies and archive documents, the film retraces this adventure and attempts to revive the past in the present as a tribute to dreamers. Saturday, March 16th at 8:00PM. 1974: Students demonstrate against a tuition increase at the American University of Beirut and occupy university offices for 37 days. With this revolt as their starting point, filmmakers Rania and Raed Rafei direct an absorbing documentary on revolution and democracy’s core issues through a meticulous re-enactment and theatrical improvisations in which today’s activists give their interpretations of 1974. Monday, March 18th at 7:30PM. Tetouan, a Moroccan port city permanently under a low and heavy sky. Three friends, small time crooks, decide to rob the town’s biggest jewelry store to escape from a hopeless future. But when the plan falls apart, the three friends must face their own separate destinies, alone. Wednesday, March 20th at 7:30PM. Between the summers of 2010 and 2012, major upheavals shook the Middle East and North Africa. The film seeks to sense the pulse of newfound freedoms amongst Egyptian and Syrian caricaturists. As we follow them prior to and during the revolutions, Syrian writer and journalist Samar Yazbek accompanies the discussion with her insights from Damascus in the months preceding the Syrian revolution. Thursday, March 21st at 7:00PM. 10-year-old Yachine lives with his family in the slum of Sidi Moumen, Casablanca. Released from prison, his Islamic fundamentalist brother Hamid persuades him and his pals to join their “brothers”. One day, their spiritual leader tells them they have been chosen to become martyrs. Thursday, March 21st at 10:00PM. 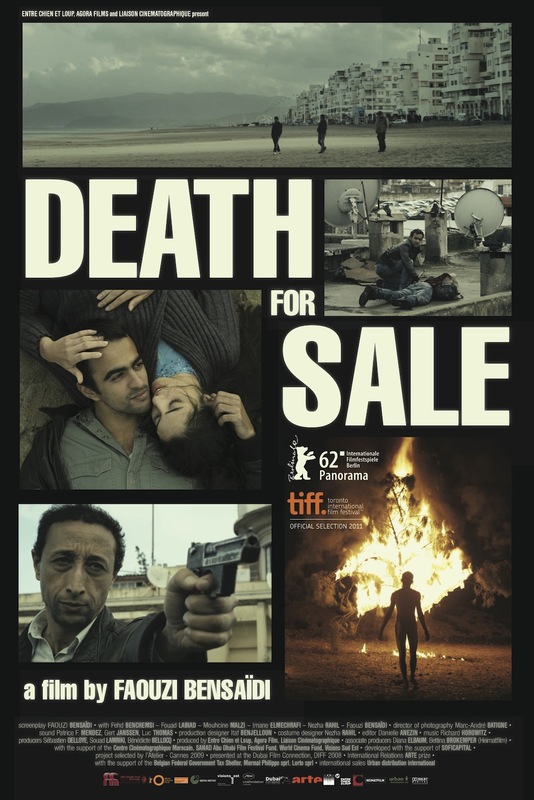 Set against the momentous backdrop of the whirlwind protests of Cairo’s Tahrir Square that began on January 25th, 2011, Winter of Discontent explores the lives of three people, each one involved differently with the Egyptian Revolution: the activist Amr, the journalist Farah and the state security officer Adel. Friday, March 22nd at 9:30PM. Sleepless are the nights of Assaad Shaftari, a former high-ranking intelligence officer in the Lebanese Forces, who feels guilt for his bloody acts during the civil war and the nights of Maryam Saidi, the mother who’s still searching for her son Maher, a young communist fighter who disappeared in 1982. While each of them is looking for salvation, the film asks if redemption and forgiveness are possible in a community that seems unable to heal itself. Saturday, March 23rd at 7:00PM. Sunday, March 24th at 4:00PM. There are two other movies that would’ve made it to the selection, Asfouri by Fouad Alaywani and A World Not Ours by Mahdi Fleifel but, both screenings are unfortunately not open to public (Invitations Only). 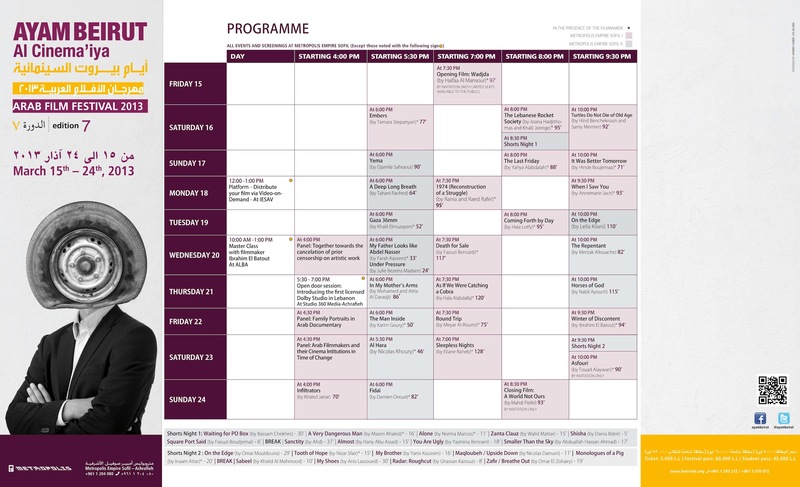 Here is the full schedule of screenings and activities of Ayam Beirut Al Cinema’iya. You selected the movies you are going to watch? Share your selection with us! Next Post Which Beer Friendship Test Would You Pass: Carlsberg, Heineken or Almaza?